Thank you for your generosity! Giving to Hope Church is an investment in eternity because lives are being changed. We are here to help people take their "NEXT RIGHT STEP" with God. It is our desire to honor God by using his resources wisely and for his purposes. We operate within God's provision and recognize our responsibility to manage the resources he provides with integrity and faithfulness. Thank you so much for your support! By setting up an online account you're able to give your tithes and offerings to Hope in a way that is convenient and secure. You can make a one-time contribution, or establish a recurring contribution once or twice a month. 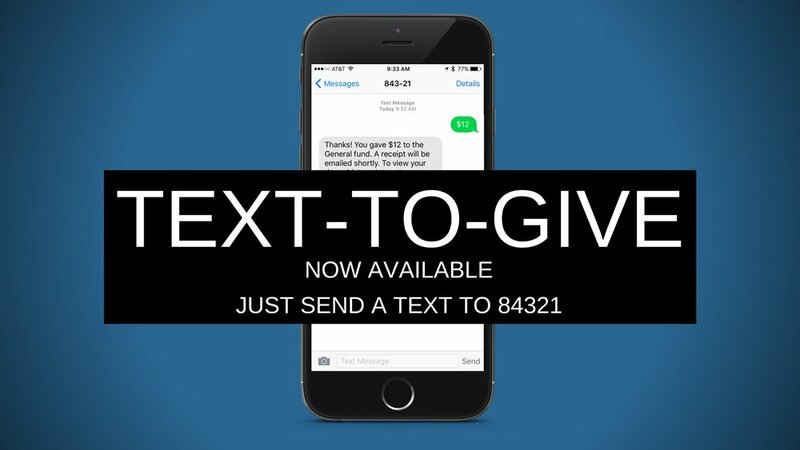 You can give by texting the number '84321'. The first time you do you'll be asked to enter your banking info. After that it's just a simple text to give! *NOTE: When you set up either online or text giving, please link your checking or savings account instead of using a credit or debit card, if possible. Our per-transaction charges are much lower when you do, so more of your gift will go towards ministry. Whether you give online, send a text, or even give cash or a check during the service or at Hope's office during the week, rest assured that your giving records are all in one place, and your year's end statement for taxes will reflect all amounts together. Thanks again for your continued generosity!